James Gamble of Harvard Medical School showed that you have to take large amounts of salt when you exercise for several hours, particularly in hot weather. Nobody has improved on his research in the last 60 years. After Gamble published his studies, people who work in the heat were given salt tablets, which is such a concentrated form of salt that they can cause nausea and stomach irritation. In the 1960s, doctors became concerned that too much salt can cause high blood pressure. They started recommending low-salt diets, which have caused many people to collapse and even die of heat stroke or dehydration during hot weather work and exercise. A low-salt diet does not lower high blood pressure in most people with high blood pressure. A high-salt diet causes high blood pressure usually only in people with high blood insulin levels. Eating heavily salted foods and drinking salty drinks when you exercise for more than two hours in the heat should not raise blood pressure anyway. If you don’t take salt and fluids during extended exercise in hot weather, you will tire earlier and increase your risk for cramps, dehydration and heat stroke.When you exercise for more than three hours, you should take in salt as well as fluids. A study from Switzerland followed female competitive distance runners who took in drinks with different concentration of salt during a four hour run.Taking in fluid without also taking in adequate amounts of salt dilutes the bloodstream, so that the concentration of salt in the blood is lower than that in brain cells. This causes fluid to move from the low-salt blood into the higher-salt brain causing the brain to swell which can cause seizures and death. Taking in extra salt during prolonged exercise increases thirst so you drink more fluids, and prevents blood salt levels from dropping so low that you become tired, develop muscle cramps, and can even die. 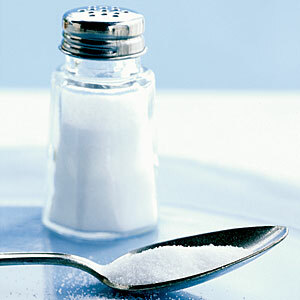 Furthermore, without salt you do not recover as quickly and are more likely to be injured or tired all the time.